Being a teenager is stressful enough, but it’s even worse when there is a dance on the horizon, and you don’t have a date. Four groups of students deal with the looming dance in their own way. Some conduct scientific social experiments, and others have to learn to dance. One girl finds out she is apparently “spoken for” (although she has no idea by whom), and another just locks herself in the bathroom and refuses to come out. With a little help from their friends and some “hip” parents, these students try to figure out if it is even possible to learn “How to Go to a Dance Stag and Still Look Cool.” Run time: 90 minutes with optional intermission. A: This play was inspired by my past and my present. The format of the show was designed from rehearsal needs. I direct two casts at the same time. I needed a show that would allow me to cast a lot of students but still rehearse in smaller, focused groups. The content of the play was inspired by the very first speech I ever gave at contest. 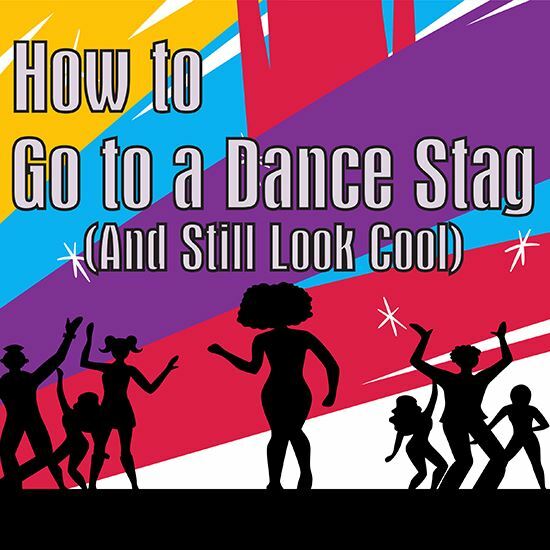 It was called “How to Go to a Dance Stag and Still Look Cool,” and it was the first theatre or speech activity I was ever involved in. When I decided to write a vignette style show, I thought it would be fun to have all of the characters show up at the dance by themselves (for a variety of reasons). I basically took that idea and ran with it. A: I love the scenes between Dad and Maggie, the simplicity of two people talking on either side of the door was something I could always “see” while I was writing. My heart pitter patters at the humor, love, and honesty of their relationship. I love Dad’s line in Part 1, “Is it that time of the…?” I honestly don’t know that the boy playing Dad knew what he was asking, but all the girls definitely knew. My all time favorite line is probably the exchange between Tyler and Logan in Bro Code- “I’m not sensitive!” “You know saying you’re not sensitive makes you sound more sensitive.” My favorite characters are Melody and Jake. Melody is everything I wish I could have been in high school: confident, cocky, a risk taker, and super honest, and Jake is the boy I hope my boys will grow up to be: sweet, talented, confident, and genuinely nice. A: YES!! Pretty much every character is someone I know or a student I’ve had. The three girls in Spoken For were originally based on my three sisters. Frankie and Gina kind of grew away from my original ideas for them, but Melody is 100% my youngest sister. Maggie is me when I was in middle school. I was very insecure, and emotional, and I felt invisible. That is why her story ends so simply. All Maggie really needs is to be noticed. Lastly, Dad is a combination of my grandfather, who passed away shortly before I began writing, and my dad. My dad is a total girl dad, and that has made him immune to the awkward, girly stuff that some men are a little freaked out about. Dad (a.k.a. Lawrence McNully-named for my grandfather) is just like my dad, but my dad’s reputation isn’t as stellar as Stud Muffin McNully’s. A: Two things. I wanted to write a show about teenagers that had no true “bad guy” because I didn’t want it to be about the mean girl, or the obnoxious guy. I wanted to write real characters that my students could connect to-characters who reminded them of themselves. So after we read it in class, I asked the students to write down which character they most connected with. They chose 24 different characters from the show. That was a proud moment for me. A: I truly love this show. The juxtaposition of simplicity and over-the-top moments. The combination of laugh-out-loud moments, and lines that make you tear up. I love the crazy, fast talking characters, and all of their one-liners and sarcasm. I’m still amazed every time I read a scene from it. I can’t believe that all of this came out of my head. I’m so grateful to Eldridge for taking a chance on this play, and, I am so excited to see what these characters look like when performed by other actors.